This old post from the summer of 2015 seems relevant this morning. At Elmwood, he and Mary Ann would lie again among twelve hundred other Confederate soldiers. (Perhaps it’s not mere coincidence that the statue’s bronze gaze has been fixed on Elmwood all these years.) 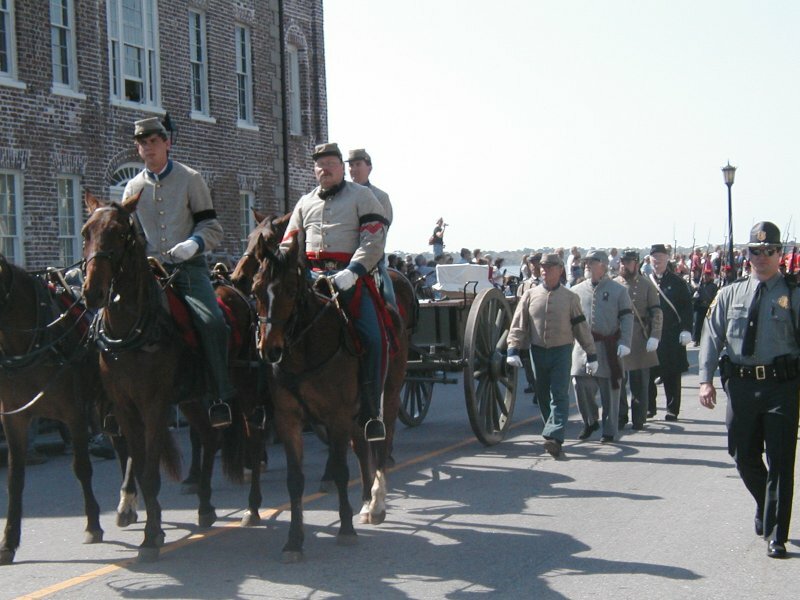 Besides which, a transfer of Forrest’s remains and re-interment a mile away at Elmwood would give the heritage folks the opportunity for a procession and pageantry the likes of which haven’t been seen since the burial of the H. L. Hunley crew at Charleston in 2004. Lord knows, to so many of Forrest’s fans practicing history consists mainly of dressing up and solemnly parading with Confederate flags. It’s a win for all concerned — for the Forrests, who apparently preferred being at Elmwood; for the city of Memphis that, rightly or wrongly, wants to be done with what used to be known as Forrest Park; and for the heritage crowd that, with a little nudging, can undoubtedly be convinced that a move is actually the right and proper thing to do. A recent Tennessee law would seem to prohibit moving Forrest and the monument, but with everyone on board with it, I’m sure enabling legislation in Nashville is a forgone conclusion. Confederate graves at Elmwood Cemetery in Memphis. Forrest should be here, too. I think we need to be done, done, with governmental sanction of the Confederacy, and particularly public-property displays that look suspiciously like pronouncements of Confederate sovereignty. The time for that ended approximately 150 years ago. But wholesale scrubbing of the landscape doesn’t really help, either, if the goal is to have a more honest discussion about race and the history of this country. I’m all for having that discussion, but experience tells me that it probably won’t happen. It’s much easier to score points by railing against easy and inanimate targets. Total agreement with this statement. Some monuments need to be moved. Others can be left in their place with interpretive displays indicating the historical context. I was a little disappointed, for instance, when earlier this year a statue of Justice Taney was removed from the statehouse grounds in Annapolis. They already had a nice display next to it discussing the horrendous Dred Scott decision. I thought that was a good way to foster historical education. On the other hand, I can fully understand why the statue was offensive and the rationale for removing it. In his will Forrest said that he wanted to be in the cemetery with his men . . ..
“I think we need to be done, done, with governmental sanction of the Confederacy, and particularly public-property displays that look suspiciously like pronouncements of Confederate sovereignty.” Nice post, but I disagree with this statement. I think we read much into those monuments when we view them as statements of winning or of success. The same martial powess visible in those statues is just as likely motivated by mournful remembrances of lost loved ones. Veterans even today tend to have traditional views of military art. We forget now, but when the Viet Nam War wall was first unveiled back in the 1980’s, veterans universally opposed it, at first. That is why the wall has a more traditional set of statues nearby – those statues of three Viet Nam era soldiers commemorate the Viet Nam veteran. They were erected to appease the veterans groups. Veterans had to have their more “manly,” traditional military statue. I served in a questionable war (Iraq), too. I hope folks do not erect and then decades later remove monuments to folks like me and my brothers and sisters. We did not serve because we beleved there were WMD’s or because we supported some neo-conservative view of the world. We served because it was our duty. This is exactly the problem. You will make your own choice about what you perceive about monuments. Other people’s choices will differ. When I saw the now-removed statues of prominent Confederates lining the main entry to the University of Texas (and only 1 of the 6 to a Texan), I saw a celebration of white supremacy. That’s why it’s important for each community to decide what monuments they want to have in their public spaces. Nevertheless, Andy is quite right that monument removal/relocation is not the most effective way to reduce racism. That brings up another concern. I am a lawyer and I practice employment law. I accuse employers of racism, sexism, and all the ism’s everyday. To show discrimination, I need either direct evidence or good circumstantial proof. Most folks do not admit to racism, so most of my cases involve circumstantial evidence. If the employer says they fired my client because he was late 5 times in a month, I want to know how many folks he fired for having 5 or more tardies in a month. That alternative explanation, truthful or not, is the heart of the case. The concern I have with concluding a particular statue represents racism is that almost every Confederate statue includes an alternative explanation that has not yet been overcome. Very many Confederate statues, perhaps all include an explanation that it was erected not to support Jim Crow, but to support lost loved ones. Yes, a few historians have argued that well, these statues were “clearly” intended to support white supremacy because 1) it shows a white general in a vigorous, “victorious” pose and 2), because it was erected during the Jim Crow period, which seems to be 1890-1920. Ok, but those pesky alternative explanations keep coming back. That is also the time period when many Confederate veterans were dying. And, certainly, many UDC chapters were trying to remember their lost loved ones. As I mentioned in my prior post, most veterans expect martial art to show some version of a strong, brave face. That is a tradition that goes back hundreds of years. If I tried to show racist intent based on the time period and the pose of the object, I would be sanctioned in court and told to stop filing frivolous lawsuits. I am no expert, but in the 2 or 3 books I have found that discuss these statues, they tend to rely on the timing of the statue and its pose to conclude it “clearly” shows an intent to support white supremacy. Surely, those UDC chapters if asked, would have supported Jim Crow and white supremacy. But, that does not mean that the statue itself was motivated by racist intent. In discrimination law, we have what they refer to as “mixed motive.” A manager can have more than one motive for firing a member of a minority. The manager can fire someone for both being black and for being late 5 times in one month. What counts is the leading or “motivating” reason for the termination. Perhaps, these statues had a mixed motive. But, as I have stated, I am a veteran. I find it hard to believe the primary motive for something as personal, as emotional as recalling lost loved ones was Jim Crow. And, then the question becomes what about the monuments to the common Confederate soldier? Was that part of white supremacy also. Or stated more like a lawyer, was the leading motivation for those statues the support of white supremacy? If it was, why rely on a simple private to convey that message? The article draws an important distinction between monuments (in which a community celebrates and promotes its own values in the person/people depicted) and memorials in, for example, a cemetery. The community should decide about the appropriateness of the former, and relevant individuals about the latter. Lee was many things, but the progenitor of residents in every community that has a statue to him seems unlikely. The statues at UT were celebrations of white supremacy, according to the University staff and students who had to live with them. The word Confederate needed to be removed from a building at Vanderbilt (to the tune of repaying millions to the UDC), according to the staff and students at Vanderbilt. I support the rights of communities to decide what monuments they wish to live with. The problem for those who wish these items to remain is that the definition of community has expanded to include people with different views. I personally am sorry that the statue of Taney in Baltimore was removed and hope that the statue of Gov. Hogg returns to the UT campus, but I don’t live in Baltimore or Austin, so I don’t have a vote. As to useful steps to take, I hope the efforts to contextualize e.g. the statues of Calhoun in Charleston and leading Confederates on Monument Ave in Richmond succeed. Maury, for example, should be much better known, to improve the understanding of the Confederacy’s aims. But ultimately the people who have to live with these things will decide. Well said, OhioGuy. The allegations against Forrest being the founder of the KKK has had folks on edge for years. That alone is enough reason to remove his statue. We haven’t done nearly enough as educators to convey all the reasons the Civil War occurred. So things like statue removal are low hanging fruit in the effort to eradicate bigotry. I’m shocked about the Irish connection in the south, since the Irish were long considered slaves and were indentured servants of the British. They knew the pain and wrong of it all: why were they on the side of the Confederacy? Very curious. Yes, Washington’s vestige was removed, along with Lee’s,from Christ Episcopal Church in Alexandria, only because the congregation was uneasy with Washington (and of course, Lee) were slaveholders. No other reason. Considering this, it’s no wonder that ISIS plundered Palmyra in the name of Allah, along with other irreplaceable antiquities, to erase even the remote possibility of a return to the former years of polytheism and false gods. No one condones that action, either, but the tendency for the victors to write history is legend. You can almost guarantee the defeated will be erased from memory. These are hard decisions, but they need to be left to the communities themselves, whether they be counties, cities, or individual church congregations. Why were the Irish serving in the Confederate army? The easy answer is because the Irish often felt a rivalry with the freed blacks prior to the war. In New Orleans, for example, the Irish took over the drayman and stevedore jobs once largely held by freed blacks. Those were well paying blue collar jobs. The other easy answer is that the Irish were not fighting to maintain slavery. They served the military out of a sense of patriotism and to obtain some measure of social acceptance. The more complicated answer is that the Republican party, still new in 1861, was composed of a good many former American (Know Nothing) party members. Immigrants in general, and especially the Irish distrusted the Republican party. But, not often reported is that at least in New Orleans, a good many Irish did not enlist. Some 33,000, I believe, enlisted throughout the war – from N.O. and elsewhere. But, a good many more in New Orleans could have but did not enlist – which is where the greatest concentration was. In one line of my family, all the Irish from four related families did enlist. On another family line of Irish immigrants, one might have enlisted in the militia. The other one young man who could have served did not appear to serve, at all. I think it was John Mitchell, a former United Irishman, who edited a newspaper in Richmond during the CW. He would say the Confederacy was essentially fighting the British. Yet, his former friend and co-United Irishman, Thomas F. Meagher, fought for the North. Umm, I thought the British supported the Confederacy and was the chief importer of southern cotton. Didn’t the south get their rifles and cannons from the Brits? I don’t understand Mitchell’s viewpoint. I picture all the Irish in the New England states, where they were greatly looked down upon-at least the Catholics were. This is an interesting question. Maybe the Catholic Irish were accepted in French-Catholic N.O. but the protestant Irish were the ones backing the Brits. So many questions. There was widespread support for the Confederacy in the UK, but the British government tried hard to remain neutral. I think it’s time to stop honoring these traitors. Can you imagine in 50 years people in Germany putting up monuments to Hitler? Treating the Holocaust as the new Lost Cause?